Rialto Beach, La Push is a stunning beach full of natural and geological wonders. Visitors can explore the rocky shores and sea stacks that once made up the Pacific Peninsula's ancient coastline. Rialto Beach can get crowded during the weekends in the summer, but the shoreline just north of Rialto is also very lovely and accessible to those willing to do a bit of walking. Rialto Beach is located on the Pacific Ocean just 14 miles west of the town of Forks, WA. Explore tide pools, seastacks, and the famous “Hole-in-the-Wall” seaarch. Camping on Rialto Beach is free and does not require reservations, but campers do need to acquire a Wilderness Camping Permit. What can I see and do at Rialto Beach? Arches and Rock Formations: Rialto Beach features rocky coves and stunning rock formations. The most popular of these natural wonders is Hole-in-the-Wall, a large wave-carved sea arch near the base of a large rock. There are miles of interesting seastacks just north of Rialto Beach. Cake Rock, a large square seastack, and the lush Dahdayla Island are located just off shore. Tide Pools: One of the many benefits of the awesome arches and rock formations is that they provide nooks and crags for many sea creatures to live in. Massive starfish, colorful anemones, various shellfish, and occasionally fish and octopus love these accessible tide pools. Though the lowest tide of the month still provides the best tide pool opportunities, many of the tidepools on this beach are located high up the beach and accessible during the lowest tides of the day (typically early morning hours) throughout the month. Hike the beach: Though the shores of Rialto Beach are more rock than sand, the beaches are an easy walk. Rialto Beach itself is only 1.5 miles long and makes for a short but scenic walk. For more rigorous hike, there are 21 miles of beautiful and accessible shoreline between Rialto Trailhead and the Ozette Ranger Station. The hike to Ozette is a great way for hikers to experience a bit of solitude on summer days when Rialto is more crowded. Camping: Watching the sun rise over the Olympic Mountains and set over the majestic seastacks in the summer is an awe inspiring sight. Why not watch both? Visitors do not need to make reservations to camp on the beach between Ellen Creek and Hole-in-the-Wall. Just acquire a pass from the Wilderness Information Center in Port Angeles. Not driving through Port Angeles? Passes can also be acquired by phone: WIC’s phone number: (360) 565-3100. Where is Rialto Beach, Washington? Rialto Beach is located approximately 14 miles west of the town of Forks, WA. Follow Olympic Highway, 101 1.5 miles north of Forks. Turn left (west) onto State Route WA-110/La Push Road. After 7.8 miles, turn right onto WA-110/Mora Road. Rialto Beach is located at the end of the road. When is Rialto Beach open? Rialto Beach, WA is open year round. It is open from sunrise to sunset for non-campers. Campers will need to acquire a Wilderness Camping Permit. Permits can be acquired at the Wilderness Information Center (WIC) in Port Angeles, or by calling the WIC at (360) 565-3100. How much does visiting Rialto Beach cost? 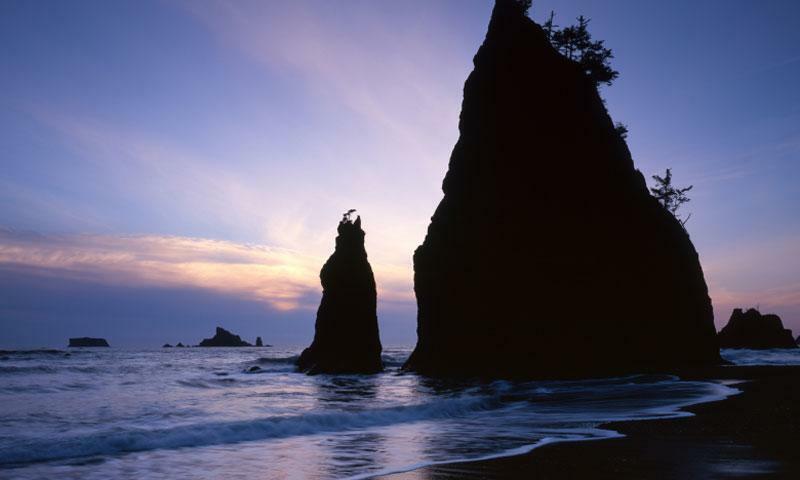 Visitors need to purchase a $15.00 Olympic National Park Entrance pass before visiting Rialto Beach.